Slow-maturing, hardy varieties of pig, particularly Tamworth and Gloucester Old Spot, make an extraordinarily succulent roast. I like to rub their skin with a salt-and-rosemary paste to encourage it to turn into good crackling. Perry, the cider made from pears, has been made in the south of the country for 200 years and is undergoing a renaissance. I use dry apple cider — and apples instead of pears — when perry proves evasive. Pork will produce more reliable crackling if the meat is dry before roasting. Leaving it unwrapped and in the open air for an hour will help. Preheat the oven to 425 degrees. Finely chop the rosemary leaves and crush them with the sea salt and peppercorns, using a mortar and pestle. When you have a sandlike mixture, pour in 3 tablespoons of the olive oil to make a paste. Put the meat in a roasting pan and massage the rosemary paste into its skin and cut edges. Roast for 20 minutes, then reduce the temperature to 400 degrees and continue to roast for 25 minutes per pound. While the pork is roasting, peel the onions and cut them coarsely. Let them cook with the remaining oil in a shallow pan over medium heat until soft and palest gold. Peel and quarter the pears (I keep them from browning with a little lemon juice). Add the onions and pears to the roasting pan after the pork has been cooking at the lower temperature for 25 minutes, basting the pears with any available pan juices. When the pork is ready, remove it from the oven and let it rest in a warm place with the pears, lightly covered with foil (a tight covering will make the crackling soften). Put the roasting pan over medium hear, add the cider, and boil the juices until reduced to a generous ¾ cup or so. They won't thicken, but you just want to concentrate the flavor a little. Adjust the seasoning. 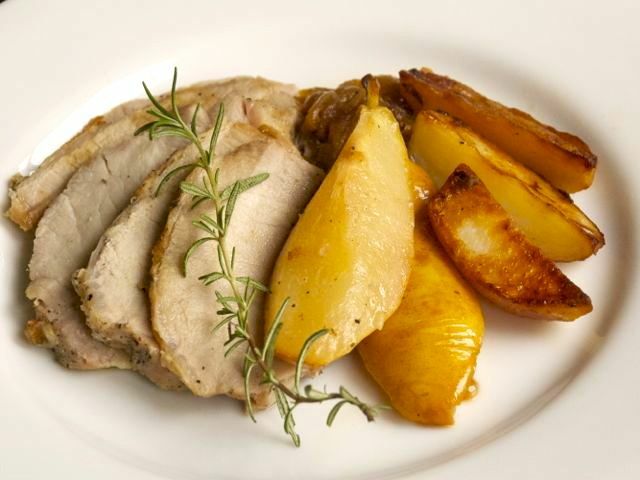 Serve the pork in thin slices, together with chunks of its crackling, pears, and oniony pan juices.